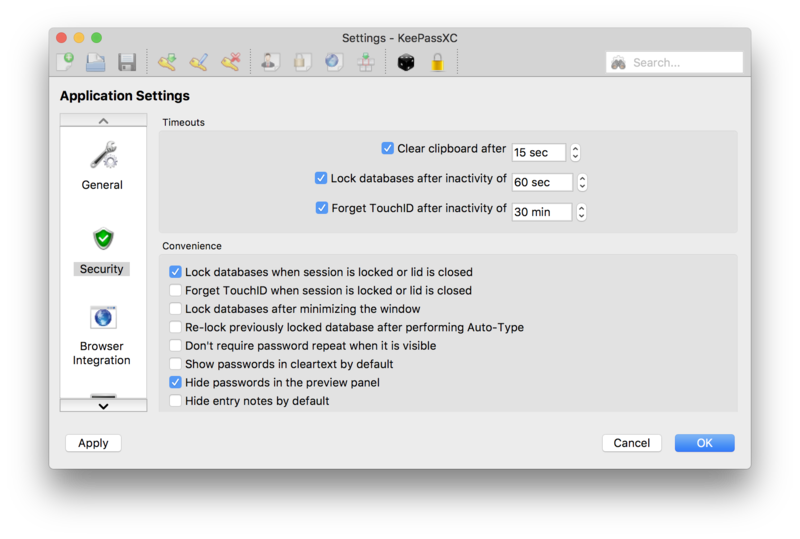 Unlock your database using TouchID on supported Macbook Pro models. Provide abstraction layer for other OS/fingerprint reader. Unlock with just putting on fingerprint w/o actively having to click unlock (KeyChain API may not allow this). So far only manually on MBP with TouchID. From the screenshot, looks like the touchid UI automatically adds a . to the end of this message, making the exclamation mark seem out of place. You're right, I'll remove it and replace the whole thing with QCoreApplication::translate(...). @weslly Does anyone of the development team have one to test with? Also, can you tell me why the build fails so I can make adjustments? Did another rebase. Any updates on a possible integration? I tried using LAPolicyDeviceOwnerAuthentication instead of LAPolicyDeviceOwnerAuthenticationWithBiometrics as suggested by that stackoverflow answer and it didn't work, but it also didn't seem to break anything either so I guess we can merge this and see if anyone else with TouchID has problems with this feature. But before that we need to have some kind of test to hide the TouchID checkbox(es) for devices that don't have the sensor available. static TouchID instance; // Guaranteed to be destroyed. I much prefer having this function body and global variable declared in TouchID.mm. Declaring it in the header may cause issues if we move this to an external library in the future. In case you would need any help with testing the feature, I can provide some sort of feedback or help if needed as I have a Macbook Pro 15'' with TouchID (2017 model). There's still an open issue with the complexity of the method DatabaseOpenWidget::databaseKey(). Does it help splitting the method up (e.g. like this)? Hey, due to previous time constraints, I'm a little late to the review party. So first of all, thanks for your effort. I haven't really had a chance to look at the code yet, but I think at least the UI needs some tweaks. The most important issue is probably the alignment of the checkbox on the unlock screen. Please fix that before we merge. After this PR we should also have some discussion about a general redesign of that screen, since it starts becoming really crowded with all sorts of options. Thanks for the feedback! Fixed the UI issue with checkboxes not being aligned and did another rebase. Great addition, thx! Happy to help testing, i have a MBP 15" 2017. Let me know when and what to do when you are ready. Hi, i just tried version 2.3.4 but couldn't find the touchid support. I thought there was nothing blocking the merger into a final version. Don't want to push anybody, but would be great if it could be in the next release. Do you have an outlook when the new 2.4 version will be released as binary? We will be doing a beta launch very soon. The last major feature was just integrated (group sharing). 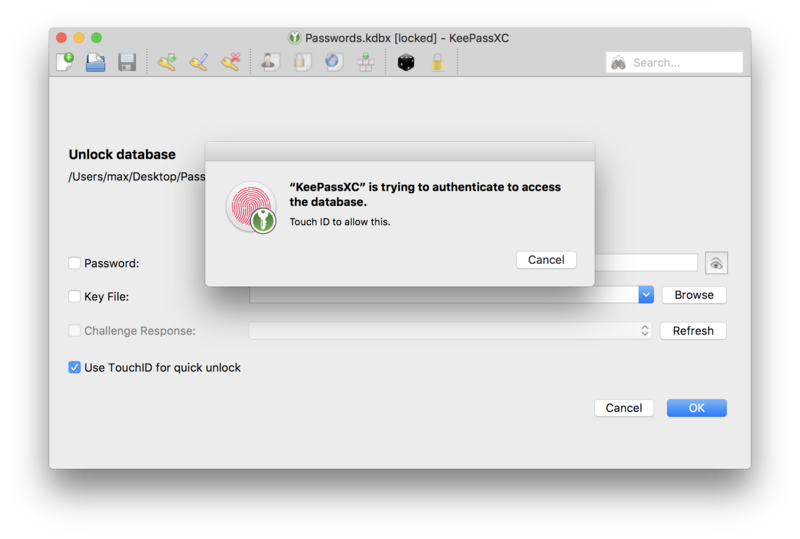 Snapshots of the develop branch are already available at https://snapshot.keepassxc.org, however TouchID does not work unless the binary is signed. Hi, i tried 2.4 Beta 1 on my MBP 2017 (Mojave 10.14.3) but can't get TouchID to work, not sure if i am doing the right thing. Should i open a separate issue or can we use this thread? When i open KeepassXC i do see the TouchID option (see screenshot below). I enter my password and open my database file. Than, when the session expires, i can't reopen it with TouchID. I have to provide the password again. If i just check TouchID and select OK it is unable to open the database. If you're using the beta version (which is probably not signed), TouchID will not work? I think @droidmonkey stated that TouchID does not work unless the binary is signed. I signed the beta version. Unfortunately I cannot test touch id since I only have a Mac mini. Please open a new issue, we may have broken it during one of our refactors. Are the entitlements for code-signing added like described in #209? I opened a new bug report for this. Let me know how i can help you test if you don't have a TouchID device. @mxk6n probably not. That entitlement definition should have been included in the repository.... I will add and re-sign. Hi, just downloaded en tried beta 2. But still not able to log in with TouchID. Should i open a new bug report? Done, see this bug report. Add an indication that TouchID is available to unlock (colored icon) on the unlock screen / greyed out when it is not. When it is disabled in the settings no icon is shown. Please make a new issue with your proposed changes.